Who is running the trial? The research team is led by Professor Kim Bennell at the Centre for Health, Exercise and Sports Medicine (CHESM) at the Department of Physiotherapy, in the School of Health Sciences at the University of Melbourne. It is known that exercise is beneficial in reducing pain and disability in people with knee osteoarthritis. However, research indicates that people who have higher body weights may respond differently and more favourable to certain types of knee exercise. 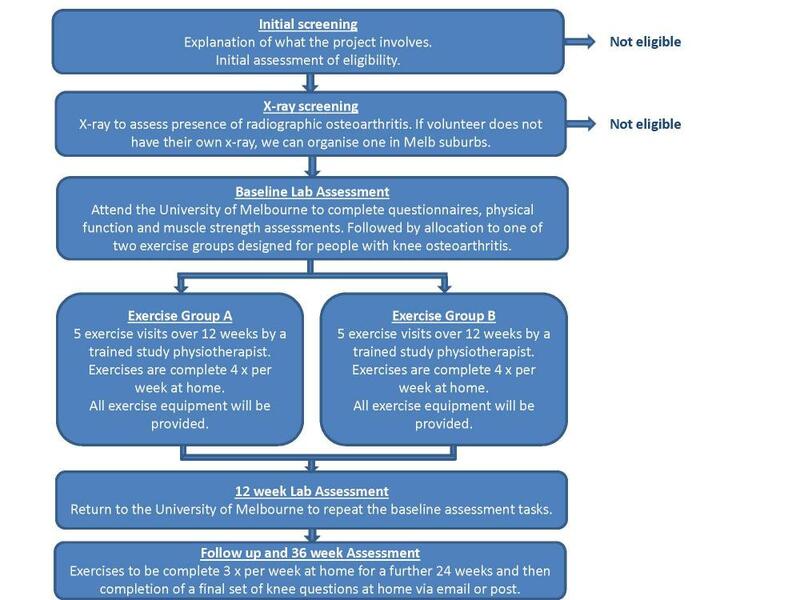 This project will specifically compare the effects of two different exercise programs for individuals with knee osteoarthritis who have higher body weights and evaluate if they respond differently to either of the exercise programs. The study will also investigate strategies aimed at helping people stick to a prescribed exercise program in the long term, after contact with a physiotherapist has ceased. and are happy to receive correspondence from the research team via mobile phone text message if required. have other muscular, joint or neuromuscular condition that affects your walking. Briefly, this project involves an initial phone screening assessment and a knee X-ray to determine whether you are eligible to participate. If you are ineligible at any of these stages we will provide you with a full explanation for why you are excluded from the study. If you have not had x-rays of your knee in the past 12 months, you will firstly be asked to attend a radiology centre for a knee x-ray to determine if you are eligible for the study. These centres are located at the Epworth Hospital Richmond, Blackburn South Radiology and Brunswick Diagnostic Imaging. The x-ray will take around 15 minutes and involves a small amount of radiation. There is no cost to you for this x-ray. If you have a suitable x-ray of your knee taken within the past 12 months, the researchers will send you a stamped addressed envelope to send the x-rays in to the University for an assessment. Once this has been done the researchers will send the x-rays back to you. If you are deemed suitable to take part, you will then attend the University of Melbourne, Department of Physiotherapy to undergo the baseline assessment, which will take around 1.5 hours. It will involve completing a set of questionnaires which ask about your personal details, knee pain and function, your medications usage, previous knee treatments, physical activity levels and quality of life. We will also conduct a number of physical tests, including your ability to perform certain tasks as fast as you can and your muscle strength. After completing the assessment, you will be able to choose the most convenient of our study physiotherapy clinics to attend for 5 exercise visits over a 12 week period. For these visits you will be allocated to one of the two exercise groups. You have a 50% chance of being allocated to either group. Over the 5 exercise visits your physiotherapists will guide you through the exercise program. You will be provided with any exercise equipment required to take home, as well as log books to complete at home to record the number of times you perform the exercises. Twelve weeks after the initial assessment, you will be asked to return to the University of Melbourne to undergo a re-assessment. You will be asked to complete a questionnaire and undergo the physical function and strength assessments similar to what you underwent at the initial baseline assessment. We will also ask you to rate your overall change in your knee since the beginning of the study. Following the 12 week re-assessment, you will be asked to continue performing the home exercises 3 times per week for the next 24 weeks. Following this period, we will send you a questionnaire either via mail to your home address or via email. The questions will be the same as you previously completed at the baseline and 12 week assessments. You will not need to visit the University of Melbourne for this assessment and can complete the questions at home. No findings that could identify you will be published. All data and results will be handled in a strictly confidential manner. This project is subject to the requirements of the Human Research Ethics Committee of the University of Melbourne (HREC No. 1544919.1). If you would like to participate in this project, or to find out more details, please click NEXT at the bottom of the page to register your interest. Or you can phone Sarah Schwartz on (03) 8344 8455. Prof Kim Bennell is an experienced physiotherapist and Director of the Centre for Health, Exercise and Sports Medicine in the Department of Physiotherapy at The University of Melbourne. Prof Rana Hinman is an experienced physiotherapist and Professor in the Department of Physiotherapy at The University of Melbourne. Mr Tim Wrigley is a biomechanist and Director of the Movement Laboratories in the Department of Physiotherapy at The University of Melbourne. Miss Rachel Nelligan is a research physiotherapist in the Centre for Health, Exercise and Sports Medicine, University of Melbourne. Mr Ben Metcalf is a research scientist, experienced in the co-ordination of physiotherapy trials for knee osteoarthritis. Mr Alexander Kimp is a research scientist in the Centre for Health, Exercise and Sports Medicine, University of Melbourne. Ms Sarah Schwartz is a research scientist in the Centre for Health, Exercise and Sports Medicine, University of Melbourne.